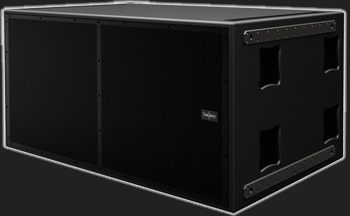 The M88 is a high efficiency, high power handling loudspeaker designed for touring sound sub-bass applications. The M88 features two, 4” voice coil, long excursion 18” cone drivers mounted in a mechanically and acoustically optimized bass reflex enclosure. The cone driver incorporates McCauley Sound’s latest FEA optimized neodymium motor with a new hybrid paper composite cone body for increased linearity and lower distortion at high output levels. The M88 enclosure features a large vent area for decreased port turbulence and integrated handles and casters which allow for easy setup, loading and transportation. The enclosure is constructed of multi-ply void-free birch hardwood plywood and is coated with a weather and wear resistant ProCoat™ polyurea hybrid finish. All rigging components are weather protected with a heat cured epoxy powder coat finish. Components in the front of the enclosure are protected by a flat grill made from perforated steel that is coated with heat cured epoxy powder, and lined with acoustically transparent foam. Tacoma, WA based AVL service provider Sound Engineering Audio deployed an arsenal of McCauley Sound Monarc Line Array and M421 high performance subwoofers to support the Satsop River Rock Festival Reunion in Hoquiam WA. An upgrade that brought intelligibility and musicality to a pristine space.